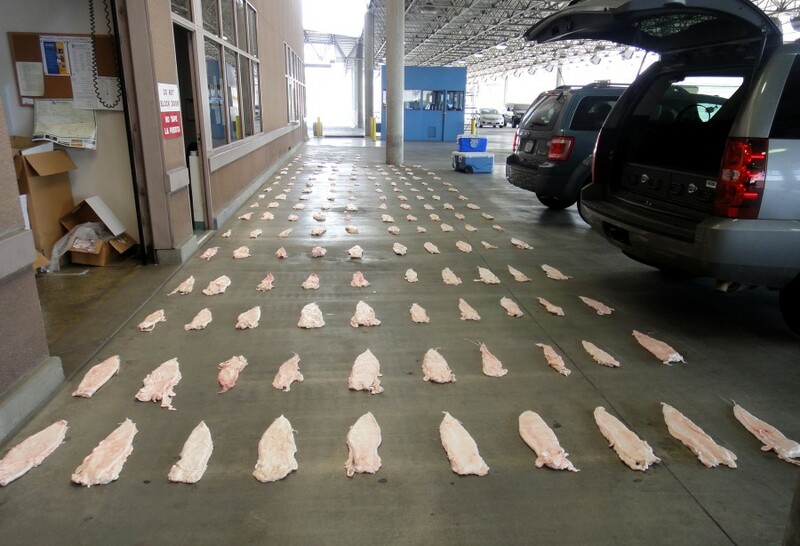 This March 2013 image provided by the US Attorney's Office shows Totoaba bladders displayed at a US border crossing in downtown Calexico, Mexico. Seven people have been charged in a scheme to sell the bladders of an endangered Mexican fish considered a delicacy for use in Chinese soup, US prosecutors said Wednesday. SAN DIEGO -- Seven people have been charged with smuggling bladders from an endangered fish in what authorities said Wednesday may be a growing international practice in which the bladders are sold for more than $10,000 each to be used in a highly desired soup. U.S. border inspectors in Calexico have seized about 500 bladders since February that were believed to be destined for China and Hong Kong, said John Reed, a group supervisor for Immigration and Customs Enforcement's Homeland Security Investigations unit. The probe began when an inspector spotted about 30 bladders buried in an ice chest. The bladders came from totoaba fish that live exclusively in Mexico's Sea of Cortez. Also known as Mexican giant bass or giant croaker, the fish can measure up to 7 feet long and weigh more than 200 pounds. The cream-colored, leathery bladders alone measure up to 3 feet. Continue reading.